The modern American attitude is defined by a sense of individualism. Simply work hard and act responsibly, and success will follow; we are the ones in command of our lives. The idea that there are factors out of our control never enters the equation. But in impoverished communities, people’s fates are decided by essentials we take for granted every day — a lack of clean water, food, or electricity. 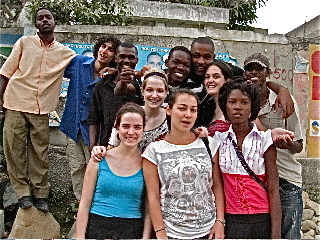 Aaron Krupp (back row, second from left) and others helped give Haitians living in poverty a voice. This inconvenient truth is what motivates Aaron Krupp, a junior at Oberlin College. Krupp has worked with the Haitian Organization Program for Education and Health (HOPEH), a group dedicated to providing easily accessible education and medical care to rural communities in Haiti. Aaron spent time with HOPEH after the devastating earthquake that ravaged the country in January 2010. He noticed a disconnect between the specific needs of Haitians and the services being provided by non-profits. So he resolved to give Haitians mired in poverty a voice, conducting an extensive survey to gain an understanding of what initiatives were making a difference. Aaron and some fellow students interviewed 60 households, asking questions ranging from cell phone use to nutrition to political participation. The information they collected gave HOPEH invaluable insight into the community’s priorities, and is playing a critical role in determining future projects. Taking on the Giant sat down with Aaron to discuss what inspired him about the survey project, the experience of interviewing Haitian citizens and what drove him to humanitarian work. Here’s HOPEH’s website for further information on their organization.